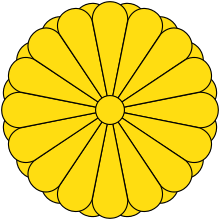 The Japanese archipelago (日本列島, Nihon Rettō) is the group of islands that forms the country of Japan, and extends roughly from northeast to southwest along the northeastern coast of the Eurasia mainland, washing upon the northwestern shores of the Pacific Ocean. 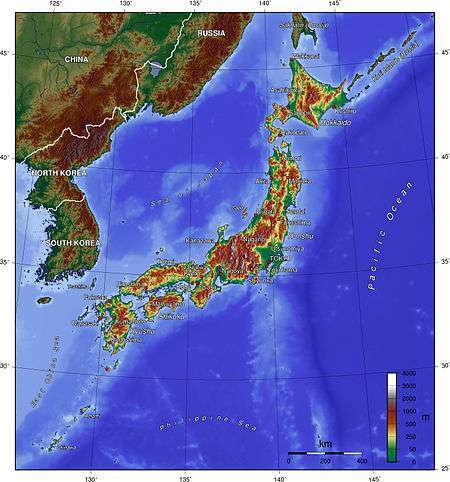 It consists of islands from the Sakhalin island arc and the Northeastern Japan arc. The archipelago consists of 6,852 islands ("island" defined as land more than 100 m in circumference), of which 430 are inhabited. 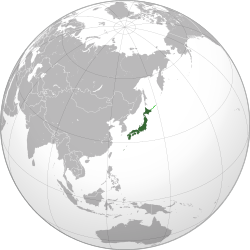 The four main islands, from north to south, are Hokkaido, Honshu, Shikoku, and Kyushu; Honshu is the largest and referred to as the Japanese mainland. 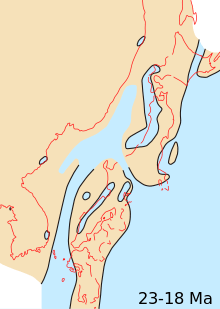 Sakhalin, part of the Russian Federation, is sometimes considered to be geographically part of the Japanese archipelago, although Japan renounced its claim to the island in the 20th century. 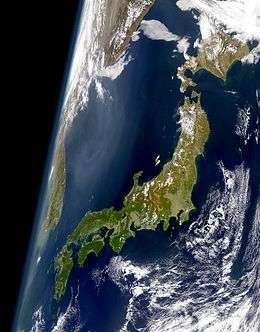 Japanese archipelago at the Last Glacial Maximum about 20,000 years ago, thin black line indicates present-day shorelines.